When we think of soybean products, the first things that come to mind may be health food staples like tofu, edamame or soy milk. But in reality, a typical soybean is more likely to end up in a ham-and-cheese sandwich or a chicken nugget than a block of tofu. Only about 6% of soybeans grown worldwide are turned directly into food products for human consumption. The rest either enter the food chain indirectly as animal feed, or are used to make vegetable oil or non-food products such as biodiesel. 70-75% of the world’s soy ends up as feed for chickens, pigs, cows, and farmed fish. 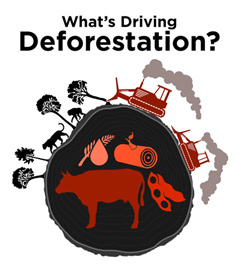 On top of these commercial products, soybeans have had an unfortunate by-product: tropical deforestation. Soybeans are a highly valuable crop for several reasons. As legumes, they "fix" nitrogen, reducing the need for nitrogen fertilizers. An excellent source of protein, soybeans are also richer in oil than most legumes, making them a good source for vegetable oil and biofuels. As global demand for meat, biofuels, and other soy products has grown, the soybean market has kept pace. World soybean production has more than doubled in the past 20 years, and while some of this increased demand has been met by improvements in yield, much of it has come from expanding soybean cultivation into new areas—such as tropical forests in the Amazon region. Until a few decades ago, tropical forest soils were not considered viable for soybeans. But advances in farming methods and crop varieties made it possible to grow soybeans profitably in new environments, including tropical forests. Before long, Brazil became the second leading soybean-producing country in the world—and soybeans became one of the leading drivers of deforestation. The good news is that deforestation rates in the Brazilian Amazon dropped by 70 percent between 2005 and 2014. This reduction has prevented about 3.2 Gt of carbon emissions (equivalent to about half of total annual U.S. global warming emissions)—and much of it has resulted from the Soy Moratorium. In 2006, pressure from non-governmental organizations (NGOs), headed by Greenpeace, led to a commitment from soybean processors and exporters in Brazil to refuse to buy soybeans produced on Amazon farmland deforested after 2006 (later amended to 2008). 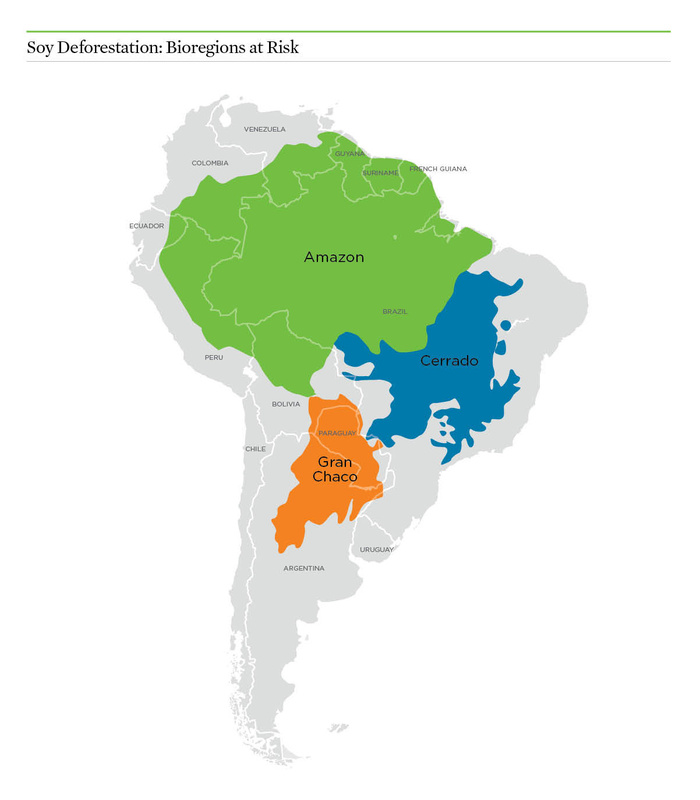 This moratorium has since been repeatedly extended, and it has worked: during the 2013-14 crop year, soybeans were found to account for less than 1 percent of total Amazon deforestation during the moratorium period. The moratorium's effectiveness has been enhanced by a concerted effort on the part of the Brazilian government to enforce deforestation laws in the Amazon. The positive impact of the Soy Moratorium—an agreement not to buy, trade or finance soybeans produced on deforested land in the Brazilian Amazon—is easy to see. While the Soy Moratorium has largely succeeded in slowing soy-driven deforestation in the Brazilian Amazon, some of that deforestation impact now appears to be moving southward into the Cerrado and the Gran Chaco, bioregions not protected by the moratorium. 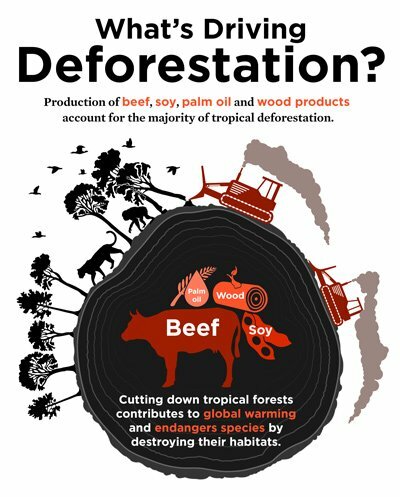 However, while the direct impact of soy has been greatly reduced, it is still playing a role in tropical deforestation. For example, when ranchers sell pasture land to be converted to soybean production, they may use the profits to continue their operations in forested areas—making soy an indirect cause of deforestation. Many experts also believe that at least some of the deforestation avoided in the Amazon has simply moved to other regions, such as the Gran Chaco, a major carbon reservoir covering an area larger than Texas. Much of this expansion is taking place in Paraguay and Bolivia, where land costs are lower and environmental protections fewer than in Brazil. Within Brazil, soy production has also been moving into the Cerrado, a region of tropical savanna and woodlands where the soy moratorium does not hold. While the Cerrado has lower carbon stocks than the Amazon rainforest, it's a biodiversity hotspot: more than 3,000 plants, mammals, birds, reptiles and amphibian species are unique to the region. Nearly 60,000 square kilometers have been cleared for agriculture in the Cerrado since 2003, and about a fifth of that land is being used for soy. Our 2016 fact sheet explains how the Cerrado has become an important frontier for deforestation impacts in Brazil, and offers recommendations for protecting the region and reducing the climate impact of land use changes there. The importance of soy on the global market is not likely to decrease anytime soon. With growing demand for meat around the world in places such as China, the United Nations' Food and Agriculture Organization (FAO) predicts that soy production will continue to increase dramatically, from around 276 million metric tons in 2013 to 390 million metric tons by 2050. Brazil, Bolivia, Paraguay, or Argentina may be likely to fill that demand. However, not all soy is grown in South America. The United States is still the leading global soybean producer. Most U.S. soy is grown in the Midwest—often in rotation with corn—and is sold domestically to animal feed millers, food processors, and the growing biodiesel industry. China and Russia are also major soy producers that consume most of their crop domestically. Because soy is grown in so many places around the world and can be used in so many different ways, there is close interaction between regions where soy production is not linked to deforestation, and those regions where deforestation is prevalent. The challenge in coming years will be to meet increased market demand for soy while continuing to reduce its deforestation impact. 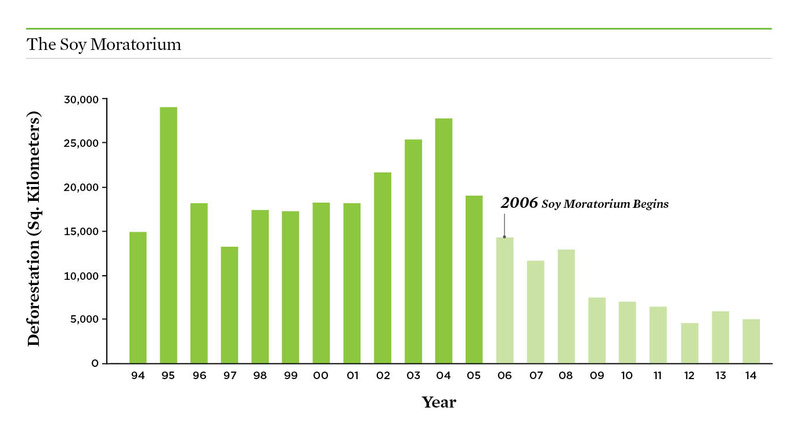 In South America, soy is likely to continuing moving into former pasture, potentially displacing cattle into new areas. But a focus on increasing yields, rather than expansion, could increase soy production without causing ecosystem destruction. There is some movement towards requiring higher standards for soy, as led by the Roundtable for Responsible Soy, a trade group setting higher-than-market standards for the production of soy. However, as of 2013, this effort only covered about 1% of Brazil’s total production. Economic and environmental conditions have aided the success of the Soy Moratorium in reducing deforestation in the Amazon forest. But until cross-border, cross-ecosystem tools and regulations are put into pace, the growing demands of the world market are likely to favor growing soy at the expense of vital natural resources.